After the mysterious events at the pond last week (well, they seemed that way to us but perhaps we just need to watch more tv) the local frogs are now convening for mating purposes. If we creep up on the pond, ensuring that our shadows do not fall over the water, 10 – 20 clearly amorous amphibians can be spotted holding on to each other. They’re surprisingly timid – or perhaps they like to keep their passion private – and if they do spot us moving around the banks, they swim down to the cover at the bottom of the pool. Nice though the idea of shy, flirty frogs is, more realistically they’re just avoiding predation – and they appear to have good reason based on the frog parts we found last week. Generally, their hormones don’t seem to be as rampant as last year – the frogs were considerably more engrossed in mating and our arrival didn’t dissuade them. 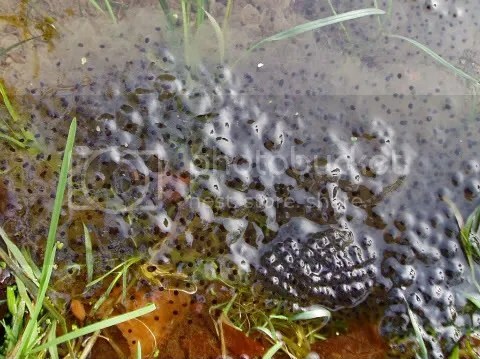 Perhaps the urge to mate is not yet at its peak – and certainly there isn’t yet the quantity of frog spawn that we usually see. The weather is set to continue mild and I’ll take another walk down there today with the camera. 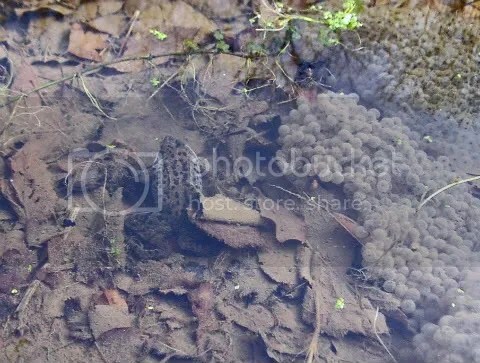 So far, frog spawn in grey water has not made a particularly inspiring photo. Freshly spawn at the edge of the pond. It looks as if some of the jelly is still absorbing water. The burrows in the bank are now collapsing and the early bramble growth is already beginning to cover them so whatever dug them a few weeks ago has moved on.